This is a Madrone Tree, one of the prettiest trees around because of its reddish bark that peels to reveal a light green layer underneath. This photo was taken in the summer, so it was not flowering, but in spring the red and green bark make a beautiful background to white flowers and red berries. 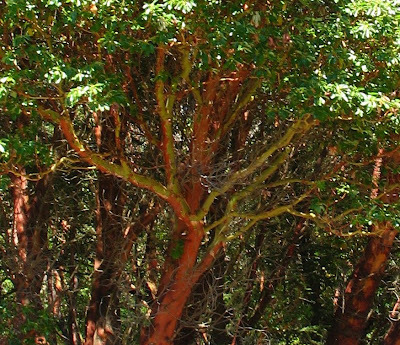 Madrone comes from the Spanish word for strawberry. You can imagine that a tree covered with what looks like strawberries would be beautiful. Here is a close-up of the red and green bark, with an ant coming for a visit. I took these photos during a kayak trip off San Juan Island in Washington State. We stopped for lunch in Deadman Bay near Lime Kiln State Park. We had started the trip in the morning from Smallpox Bay. Fortunately there was no bad karma on our trip from these two bays with sad histories. Without getting too much into the gory details, Deadman Bay got its name because the bodies of illegal Chinese immigrants would wash up here after being thrown overboard by smugglers trying to escape US Customs agents. Smallpox Bay was named after the Native Americans who tried to treat their smallpox fevers by bathing in the cold waters of the bay. They contracted smallpox, which they had no immunity to, through contact with European settlers. 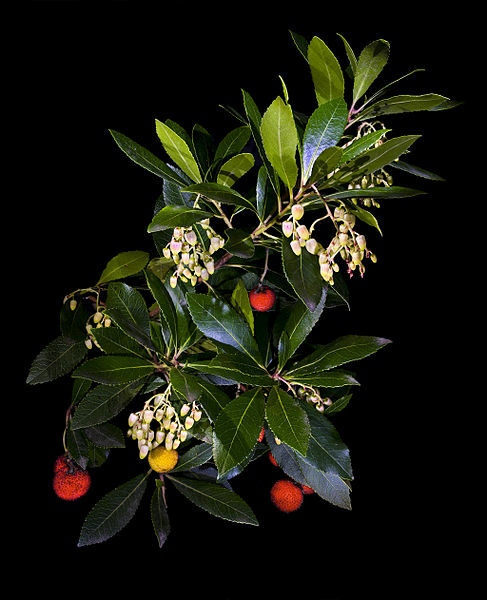 Although the Madrone Tree was of no help in treating smallpox, Native Americans did use its leaves and bark to treat a variety of other illnesses including stomach ailments, skin problems, sore throats and colds. They also ate its berries. 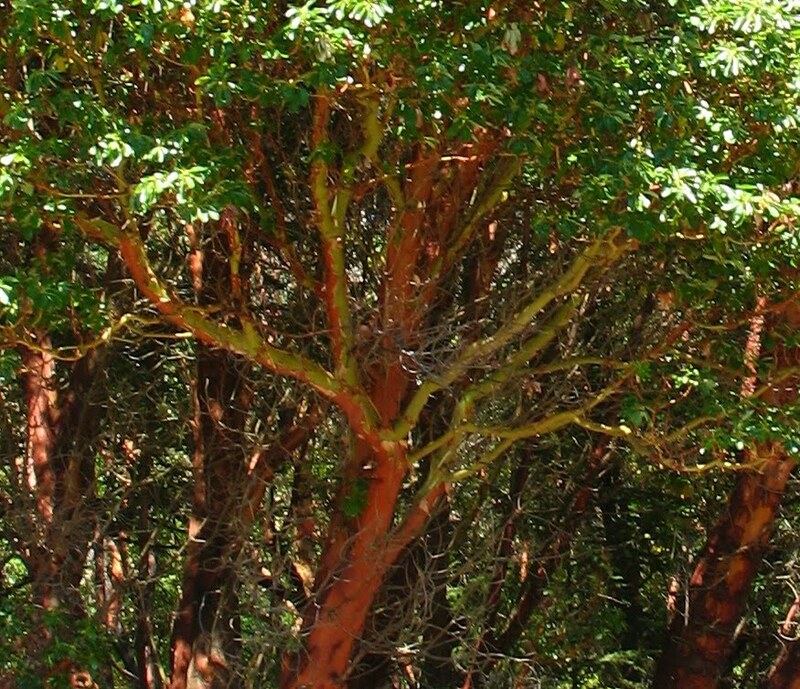 A Native American legend explains that the reason Madrone Trees are often found on rocky coastlines like Deadmay Bay is that it is the Madrone's job to hold the earth together with its roots. Today's less romantic explanation for why Madrones thrive on rocky coastlines is that they are broadleaf evergreens, in the same family as the Rhododendron. Their large leaves are active year-round, compensating for the poor soil conditions. Madrones are well suited for the relatively mild winters of San Juan Island. Evergreens in areas with colder winters generally have needles rather than broad leaves. I'm sorry to hear that they are being attacked by a virus. They are definitely beautiful. And the wood has a unique look and lots of burls, so it makes nice ornamental objects. What an interesting experience you had and a wonderful way of describing the Madrone Tree. Indeed, this tree can be a lovely choice for certain locations that can be considered when landscaping. Aside from its medicinal properties it also has a certain charm that is just appealing. Cùng đồng môn với nhau rồi, bên bạn có gia van chuyen hang hoa di Ha Tinh, tim xe van chuyen hang hoa Nha Trang, vận chuyển hàng hoá ra Khánh Hoà giá rẻ không. Bên mình có lắp đặt thang máy gia đình 450kg, thang may benh vien, lắp đặt thang máy chở hàng 50kg cần xe chuyen hang di Vinh để cung cấp cho dự án bãi giữ xe thông minh, vậy bên bạn có gia van chuyen duong bo rẻ không? Very Nice blog. Now these day the technology changed a lot humans as well as environment. The germination chamber, improve uniformity, decreases the lead time and increase the numbers of seed to germinate.